An internationally heralded debut novel of extraordinary warmth, insight and humanity that will appeal to readers who loved The Unlikely Pilgrimage of Harold Fry and Still Alice: Elizabeth Is Missing is at once a page-turning mystery that takes us from post-war Britain to the present day and a piercingly honest portrait of love and memory, families and aging through the lens of an unforgettable protagonist who will seize your heart--an elderly woman descending into forgetfulness, as she embarks alone on a quest to find the best friend she believes has disappeared. As long-ago memories emerge, Maud begins to uncover forgotten clues to her sister's disappearance and to piece together the mystery that has haunted her family for decades, discovering new momentum in her search for her friend. 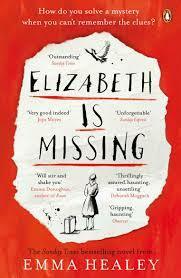 Could the mystery of Sukey's disappearance hold the key to finding Elizabeth?